Tamedia's Centre d'Impression Lausanne print centre is upgrading press controls as part of a plan to secure long-term availability of its Wifag Evolution 371. 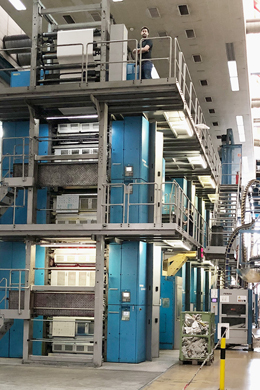 ABB will retrofit controls on the press, which has five towers, two folders and six reelstands and prints a vaiety of group products for the French-speaking part of Switzerland including well-known titles such as 24 heures. The Wifag press consists of five printing towers, two folders and six reelstands. ABB will replace control systems on two towers and two reelstands and also new section control systems. New systems being supplied are based on its AC500 PLC and will be commissioned without taking the press out of production, and will support mixed operation of old and new systems. Head of ABB's printing department Damian Staedeli says the order is the second order in a couple of months which will see themreplacing Wifag Platform systems based on AMK Symac hardware. The CIE order follows the one from Gannett's North Jersey Media.